A third international T20 century from Glenn Maxwell delivered victory for Australia in Bangalore to secure the series against hosts India. Maxwell made an unbeaten 113 from 55 deliveries as the tourists picked up their first limited-overs series win in over a year. He became the first Baggy Greens batsman to make three T20 tons, hitting nine sixes and seven fours to see his side home by seven wickets. Maxwell, who also top-scored in the series opener, shared a 73-run stand with D'Arcy Short, who also backed up his promising performance in the first T20 by making 40. Australia were able to claim a first T20 series against India despite Virat Kohli having made an unbeaten 72 off 38 balls. The home side posted an imposing total of 190-4, but Australia were able to overcome a disappointing start to reach their target with two balls to spare. Marcus Stoinis and captain Aaron Finch were out inside the first four overs, without reaching double figures, to bring Maxwell to the crease at 22-2. After Short was dismissed by Vijay Shankar, slicing the ball high in the air to KL Rahul in the covers, Maxwell sealed the deal alongside Peter Handscomb. He dominated their unbeaten partnership of 99, reaching three figures in the penultimate over, but holding off on celebrations until victory was assured. It was Australia's fourth-highest successful T20 chase, and Maxwell said: "This means a lot to all of us; we haven't had a lot of success over the last 9-10 months. "Winning momentum is really good momentum, so if we can keep that going towards a World Cup it's only going to hold us in good stead." 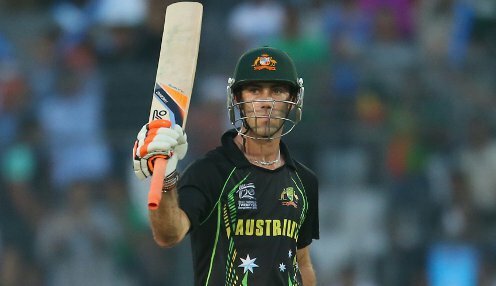 Australia are 7/4 to win their first ODI against India, who are 4/9, while Maxwell is 9/2 to be the tourists' top batsman.